It's been said you have a quiet strength. You don't yell to get your point across or go out of your way to garner attention, yet you seldom go unnoticed. You're feeling a bit weary today, but you're resilient. A pair of shoes like this sculpted shoe by Jil Sander will pay homage to the fact that life's challenges only give you more character. The chiseled wood platform and slightly serrated edges of the upper give them a weather-worn look. However, the narrow, stilt-like metal heel is a testament to the balance between vulnerability and toughness. Still, the sandy color of the suede upper adds a softness to the shoes. After work, when it's time to unwind and imbibe, ask the bartender for a Steel Helmet (photo & recipe by Colleen Graham of About.com). The combination of Effen Vodka, Kahlua Coffee Liqueur, milk and Galliano Liqueur has a flavor similar to a vanilla coffee milkshake. 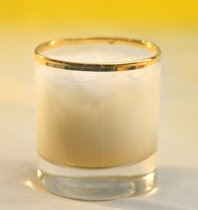 However, the hints of ginger and anise in the Galliano add a touch of spice. Just remember that too many Steel Helmets in your glass may leave you wishing you also had one for your head. *P.S. 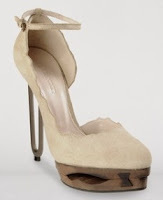 If you like the idea of a wooden platform and an ankle strap, but you're not in love with the idea of spending $1,130 on a pair of shoes, check out Via Spiga's Odette Platform Sandal (available at S&B advertiser, Amazon.com).